I’m not an enormous fan of tango, but there are quite a few songs that I’ve grown to love. And before you ask, no… I’ve never taken a dance lesson. Far from being clumsy on my feet—I grew up in Memphis after all—it’s one of those cultural experiences I keep saying I’ll do one day. That day has yet to arrive, but I thought of something yesterday when Jeff & I were discussing the difficulties of translation. He’s done a very nice month-long series of posts about Borges since June 2006 was the 20th anniversary of his death. We had trouble agreeing on how to translate one simple line of poetry, so I decided to take the ultimate challenge… translating a tango song. I think I’m asking for trouble. 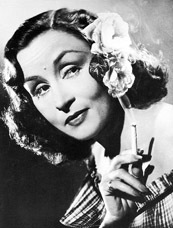 One of my favorite tango performers is fiesty singer/actress Tita Merello. Some of her well-known tango songs are “Arrabalera” & “Se dice de mí.” True classics. Her style is very in-your-face. You don’t like what she says or how she looks? Too bad. Your loss. That’s the kind of brashness she’s associated with & now you know why I like her so much. “Qué vachaché” was written by Enrique Santos Discépolo in 1926 & instantly became a permanent part of her repetoire. It’s funny how the song is 80 years old & still rings as true as when it was first written. Since tango is heavy in lunfardo (local slang), I’ve chosen to go heavy on English slang. While it may not be the best translation out there, I tried to convey the sense of sarcasm that pervades this song. Piantá de aquí, no vuelvas en tu vida. Ya me tenés bien requeteamurada. ni oírte así, decir tanta pavada. ¿No te das cuenta que sos un engrupido? ¿Te creés que al mundo lo vas a arreglar vos? ¡Si aquí, ni Dios rescata lo perdido! ¿Qué querés vos? ¡Hacé el favor! Get outta here, don’t even think about coming back. I’ve had it up to here with you. or listen to you talk so much crap. Don’t you realize you’re being played? You really think you’re going to fix the world? If here, even God can’t save those who are lost! What can you do about it? Puh-leeze! ¡Plata, mucha plata! ¡Yo quiero vivir! tengas amigos, casa, nombre…y lo que quieras vos. la panza es reina y el dinero es Dios. Money, lots of money! I want to have it all! you’ll have friends, a house, a good name… whatever you desire. the stomach rules & money is my religion. que la razón la tiene el de más guita? y a la moral la dan por moneditas? frente a dos mangos moneda nacional? that the one who’s right is the guy with the most bling? and morality is handed out for mere pennies? All dressed up… with no place to go. ¡Tirate al río! ¡No embromés con tu conciencia! Sos un secante que no hace ni reír. ¿Qué culpa tengo si has piyao la vida en serio? ¿Qué vachaché? Hoy ya murió el criterio! Vale Jesús lo mismo que el ladrón. Go jump in the river! Get over it! You’re a partypooper who takes the fun out of everything. Money, money, money! I want it all! Am I to blame if life has made a fool out of you? A thief gets as many props as Jesus. Walking along Avenida Corrientes yesterday, the front display in one of the bookstores was an enormous pile of Clarín tango CDs. Their 20-disc series covers the greatest names in tango music, past & present. Starting in September 2005, there was one available every week at the corner newsstand for 15 pesos. Now that the series is over, they’re going for 9 pesos each. U$S 3 for an huge booklet full of history, lyrics, photos & interviews?! Even if you aren’t very tanguero, it’s a great price to experience excellent tango. Maybe I’m slowly convincing myself that I enjoy tango. Not enough to dance like Caroline, but at least enough to get a feel for what it’s all about. The problem with any compilation is that there will be songs missing. Compilations are 100% subjective. For me, an obvious omission on this CD was “Niño Bien.” Since they didn’t include it, I decided to post it here. The song is basically about a guy who tries too hard to impress & is very pretentious. But Tita can spot it a mile away & calls him on it. I wish I had met her in person before she passed away in 2002! Again, this wasn’t easy to translate although there are only 3 verses. My apologies for any glaring errors, & some things are explained in notes below. Have a good laugh. todos los días sale a vender fainá. goes out everyday to sell fainá***. te creés que sos un rana y sos un pobre gil. you think you’re da bomb & you’re really just a loser. para lucirla detrás de un mostrador. to show off behind a salescounter. * Most Argentines (contrary to the rest of Latin America) only use one of their last names. Using both is seen as extravagant. ** Former classy hangout of Borges on Calle Florida which lost a lot of its charm. In fact, it was sold & closed in Aug 2011 & replaced with a Nike store. *** Fainá is a flatbread made with garbanzo bean flour, oil, water, & salt. Basic protein, basic food. **** A famous cabaret in Buenos Aires. If you understand and like the style of Tita… then you got the best of Argentine tango. I am not a tango fan either, but I love her. And nothing, really nothing, beats her singing “Se dice de mi”. That’s definitely one of her better songs. It’s funny… I’ve never cared that much for Gardel but there are certain singers I really like. I guess that happens with any kind of music. Saludos! I think you did a pretty good job of translating Qué vacheche and El niño bien. I have a few quibbles but overall you saved me hours of work. I would like to use your translation of Que vacheche in a scholarly article on Subiela (Argentine filmmaker) and Cortázar, since Cortázar cites the line “Qué vacheche” and I have a footnote on that tango. Subiela keeps the poem by Cortázar at his side when he writes his scripts. Please send me an email with your full name so I can give you proper attribution in the article. BTW scholarly articles are never paid. Thanks so much for the music links too. I had not heard the song before. Hello Nancy – The translations were a collaborative work. I had most of it done, then asked a couple of Argentine friends for explanations of some lunfardo terms that are rarely used these days. Glad you found the translations helpful. Feel free to use the translations. No problem. If you could notify me when the article is published, I’ll download the PDF from JSTOR. Endless Mile: the online home for tour guide & guidebook author, Robert Wright… sharing his explorations, observations & travel expertise about Portugal, Spain & Argentina since 2004. ©2004-19 Robert Wright. Photos & text may NOT be used for commercial purposes or for derivative works.